A Previous article “How to choose data recovery software your data lost?” talks about standards of good data recovery software. Here I’ll make a further discussion on free data recovery software in this post. There is no doubt that most of people have encountered data loss, and do you still remember how did you handle the data loss problem? Did you look for professional data recovery service centers, or buy some recovery software? Neither is the best choice! Actually, there does exist free data recovery software and it is equally powerful enough to deal with most data loss situations. 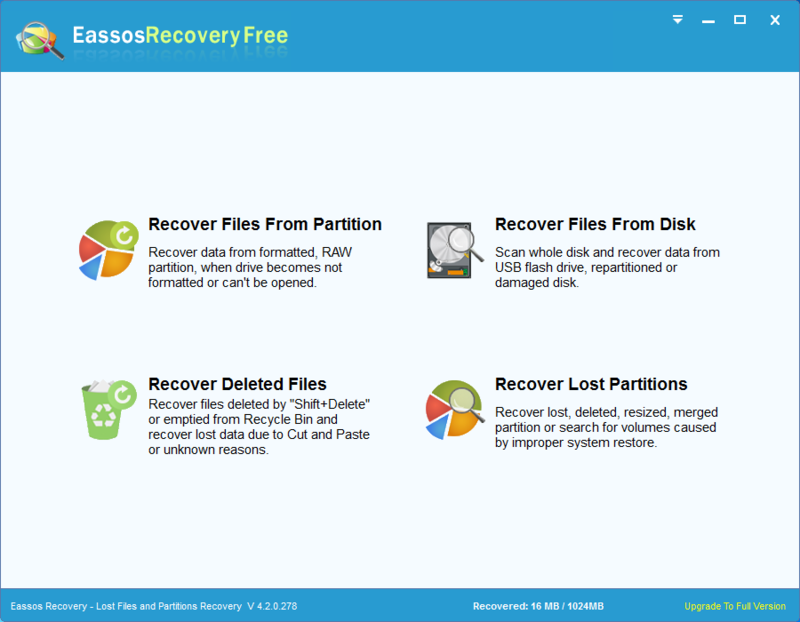 Eassos Recovery Free is a piece of free and easy-to-use recovery software, which can recover files deleted by “Shift + Delete” or emptied from Recycle Bin, or lost due to software crash, formatted or damaged hard drive, virus attack, lost partition or other unknown reasons. It supports IDE, SCSI, SATA hard disks, USB flash disk, memory cards such as SD and mini SD, and it supports FAT (12/16/32) NTFS and EXT3 file systems. Recover Files From Partition. Recover files from the specific partition. It scans the whole partition and then displays all the files it finds out. This function is used when the partition is formatted or becomes “RAW” (it prompts to format) or the partition can’t be opened. Recover Lost Partitions. Recover lost or deleted partitions and repair partition table. This function is applied when partition is lost or combined or the partition is lost caused by incorrect Ghost operations, etc. It can recover the whole partition directly without copying files to other disks. Recover Files From Disk. Recover files from a specified disk. It searches the whole disk and displays all the partitions and files it finds out. This function applies to the situation that partition table is damaged and can’t be recovered or the first two modes don’t work well. Recover Delete Files. Recover deleted files from partitions. This function applies to the case that files are deleted and no new files are written in. Free of charge. 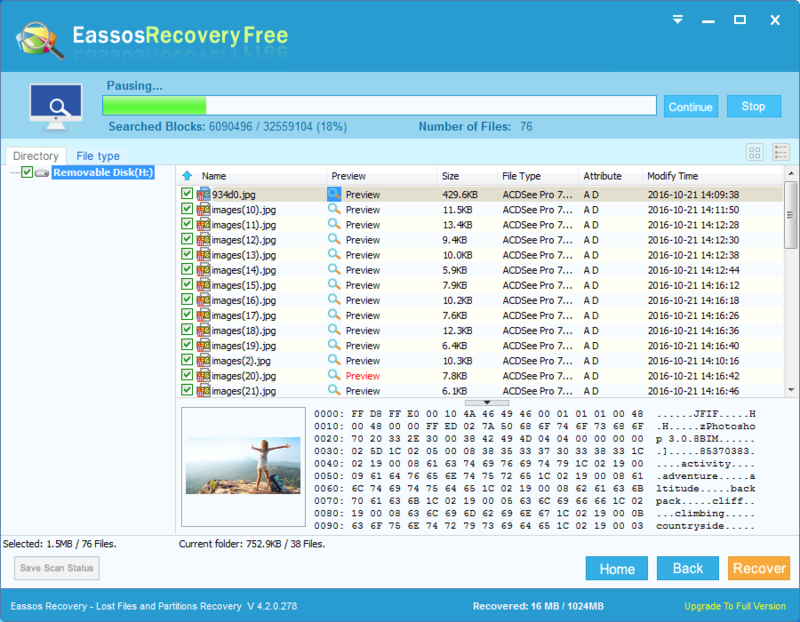 This is the free version Eassos Recovery, but it works the same as the paid version when it searches for lost files or partitions. Thus the scanning and recovery result is the same. If you are satisfied with the recovery result of the free version, you can consider buying the full version. Advanced scanning algorithm. This free recovery software adopts the scanning methods of PartitionGuru which is an advanced data recovery and partition manager application. Safe and fast. The entire recovery process is read-only and does not write any data to original device or lost data. Easy-to-use. The wizard recovery interface guides you step by step throughout the whole recovery process, which does not require users have a good command of computer skills. File preview is provided. This simple recovery offers powerful file preview feature, helping users to make sure whether files can be recovered correctly in advance. It supports preview photos, video, audio, documents, text files, etc. so that you can check original file content directly. Various devices are supported. It is able to recover lost files & partitions from all kinds of storage devices such as hard drive, external hard drive, USB flash drive, SD card, pen stick, SSD, etc. Besides, files system like NTFS, exFAT, FAT32, FAT16, FAT12, ext2, ext3 and ext4 are supported. How to recover lost / deleted files using free recovery software? Here is a step-by-step guide to present the process of recovering deleted / lost files with this free data recovery software. 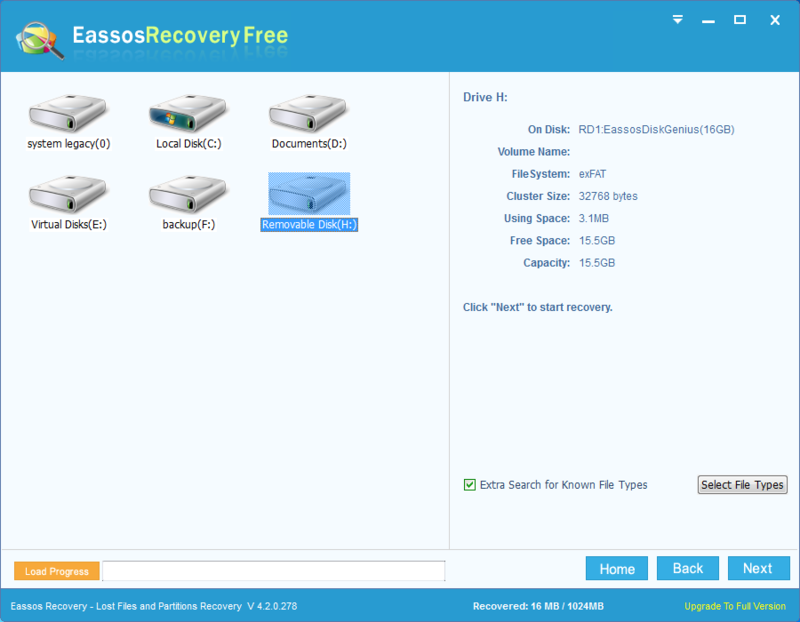 Step 1: Install and launch Eassos Recovery Free from Windows computer. Note: do not save the installer or install the program to the partition where you want to recover lost data. Step 2: Select recovery mode from the main interface. You should choose a proper recovery mode based on data loss causes. Step 3: Select the device to scan. Choose the partition or disk where lost files were stored and click Next button to scan selected area. Step 4: Preview & filter recoverable files. You can preview files in scanning result or filter file so that you can find out those files you want to recover quickly. Step 5: Recover data. Select files and folders you need and click “Recover” button, and then you can select a location to save recovered data. This entry was posted in Data Recovery and tagged data recovery software, free data recovery software, free recovery software by EASSOS. Bookmark the permalink.